A little motivation can go a long way, especially when you’re facing an illness like mesothelioma. Some days are tougher than others, but with the right perspective in mind, the rough days can become a little easier. In your moments of doubt, fear or frustration, you can seek out sources of motivation and inspiration to return to a healthier state of mind. Keep this list on-hand for those challenging days, and remember you can reach out to loved ones for support. If there’s one thing someone with cancer needs, its love. Whether given in the form of words, quality time, help, or physical affection like a hug, every person facing an illness benefits from feeling love. In fact, loving touch from family and friends has shown to boost immune health in scientific studies. Don’t hesitate to ask for a little extra love when you need it, because it’s good for your health. Faith is a state of being, thinking or feeling that exists with or without religion. Faith is placing trust and hope in aspects of life we cannot see or feel. For some people, that translates into faith that everything unfolds as it should, and that the timing and events of our lives happen perfectly, regardless of the pain or joy they provoke. Faith can bring a sense of inner peace from the trust and a deep knowingness that everything is as it should be. 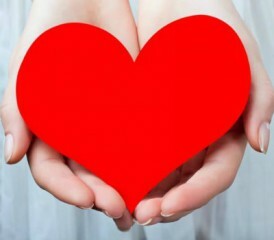 Giving acts can sure fill the heart with joy, and it turns out that charitable work can make our hearts grow stronger. Research on people with coronary artery disease who volunteered after experiencing a heart attack found a decrease in depression that reduced the risk of mortality and added years to life expectancy. In addition, social scientists say other benefits come from giving, such as economically through tax breaks, socially through signifying personal wealth or humanitarianism, or psychologically through the happiness that follows gift-giving. A deep sense of satisfaction can accompany helping others in need, and according to a Stanford University study, it helps us to live longer. Stanford researchers found a 40 percent reduced mortality risk among elderly persons who volunteered more than two hours a week for several years. How does one find hope after receiving a terminal diagnosis? They redefine hope. Hope is commonly defined as an expectation that life will work out in a good way. This description is devoid of the reality that difficult times happen. People often experience growth and learning when life doesn’t work out the way they hoped. “Hope is definitely not the same thing as optimism. It is not the conviction that something will turn out well, but the certainty that something makes sense, regardless of how it turns out,” said Vaclav Havel, humanitarian and beloved former president of the Czech Republic. Both mental and physical health is heavily impacted by excessive worrying. Anxiety and worry causes the release of stress hormones such as cortisol. These hormones increase the amount of sugars and fats in the blood and cause physical reactions like a fast heartbeat, difficulty concentrating, muscle tension and nervous energy. Over time, the increase in stress hormones can suppress the immune system and cause digestive disorders, short-term memory loss and premature coronary artery disease. Being mindful of worrisome thoughts is the first step. Once you’re aware of such thoughts, you can practice consciously choosing a less stressful perspective that will reduce anxiety. With practice, it becomes easier to replace thoughts of worry with thoughts of ease. Eventually, with dedication to choosing healthier thoughts, it will feel increasingly natural to think peacefully. Never underestimate the power of your brain. Even though your brain can feel foggy as a result of certain cancer therapies, the side effect may not last for long because the brain can repair itself in remarkable time. The average human brain is home to 100 billion neurons, which are the nerve cells that use electrical and chemical signals to transmit information. Each of these neurons has anywhere from 1,000 to 10,000 synapses, the points where information is exchanged between neurons. After certain therapies, it may feel like your neurons aren’t firing so well. Be patient as this will improve, and be vocal about any symptom involving the brain so your health-care team can remain informed. Wallowing is self-pity is widely accepted as unhealthy. Ruminating on how pitiful one may feel seems to beget more self-defeating thoughts and feelings. “When we pity ourselves all we see is ourselves. When we have problems, all we see are our problems and that’s all what we love talking about. We don’t see the good things in our lives,” says author Ann Marie Aguilar. Acknowledging the bad is just as important as acknowledging the good, for we can’t suppress or ignore anything that evokes emotion and expect it not to resurface. One key to avoiding self-pity is remaining mindful of your focus. Are you disproportionally focusing on the bad? If so, set an intention to focus on the good in your life and make a list. 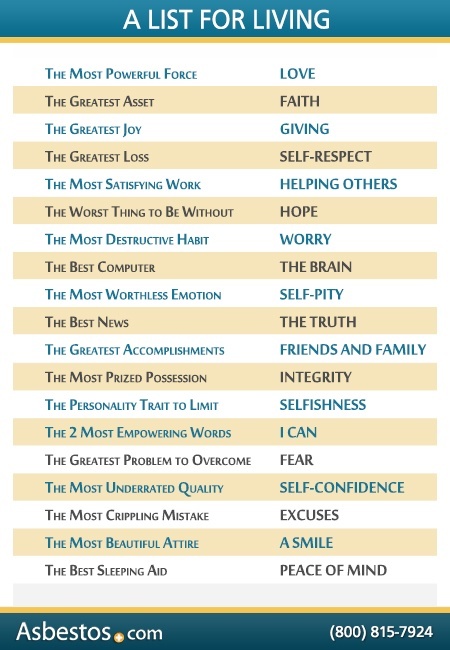 Keep this list of good stuff to focus on handy. When you observe yourself focusing on the bad, turn to your list and revel in gratitude for your blessings. Most people with mesothelioma agree that they’d rather hear the truth from their doctor about their prognosis than a response that skirts around the truth. The prognosis may be grim for most people facing mesothelioma, but knowing the truth about your diagnosis will prepare you to make the best decisions about your future. Though the truth is difficult to hear sometimes, facing the truth can feel liberating and empowering. During a time of need, friends and family mean everything. And spending quality time with friends and family is important to people coping with cancer. Being surrounded by loved ones reminds someone with cancer of all the support they have around them, and this encourages them to cope better. A study on adults with cancer found that patients’ perceived prognosis increased their need for support from friends and family more so than the severity of their condition. Because mesothelioma patients receive such a difficult prognosis to accept, they surely benefit when friends and family are available for support, whether physical or emotional. As children we learn the importance of sharing and the harms of selfishness. Too much selfishness can contribute to isolation and self-centeredness. Yet, too little selfishness can leave us feeling estranged from ourselves. Personal needs are met when a balanced focus on the self is achieved. This balance is important for people with mesothelioma to maintain, because a healthy dose of selfishness can help maintain mental, physical and emotional health. When you find yourself in doubt, “I can” statements help turn your perspective around. For example, if you’re feeling doubts or fears about coming to terms with your diagnosis, repeating “I can face this with grace” will empower you to shift perspective. The more you repeat “I can” statements, the more believable and real they will feel, and your self-appreciation will receive a boost. For someone diagnosed with mesothelioma, the fear of death, what many consider the ultimate fear, can feel distressingly real. Overcoming such a deep fear is a personal process and often involves spirituality and support from loved ones. Speaking with a spiritual leader or meeting with a counselor can help someone with cancer sort through their fears. “Facing your fears robs them of their power,” says five-time Emmy Award winner Mark Burnett. Self-confidence is wonderful to have before a cancer diagnosis, but often, people living with cancer notice a boost in self-esteem despite the challenges they face. Some cancer survivors say once they confronted a life-threatening illness, all the little stuff that used to affect their self-confidence didn’t seem to matter as much. It’s worthwhile to cultivate self-confidence, as research has found that people with good self-esteem tend to make healthier lifestyle decisions that lead to improved overall health. To psychologists, excuses are a form of rationalization. When rationalizing, a person crafts explanations for actions, behaviors or thoughts that are difficult to accept or understand. Excuses are a coping and defense mechanism that can stray us from our sense of self and reality. If we practice mindfulness and learn to see our excuses truly as false rationalizations, we can start to drop the excuses and accept the truth of what troubles us. In addition to inciting joy in others, a genuine smile might improve your health. Two scientific studies found that people who smile the most tend to live longer and happier lives. Smiling sends positive feedback to the brain that reinforces feelings of joy. Crack a genuine smile for the health of it; it’ll make you feel good. Getting seven to nine hours of sleep a night is important for everyone and even more important for someone facing an illness. Lack of sleep can lead to grogginess, irritability and tiredness in the short-term and it can even impair the immune system. According to sleep researchers, cells do a lot of repairing during sleep and that a decrease in T-cells (a type of white blood cell central to immunity) occurs when people are sleep deprived. The value of enough sleep cannot be understated to someone with cancer. But what if you’re having trouble sleeping as a result of stress or treatment side effects? Consider speaking to a mental health counselor or an oncology social worker to take steps in a more restful direction, and let your doctor know if sleeplessness persists. Do you have any words of motivation to share with other mesothelioma patients? If so, share with the mesothelioma community on Facebook.